Real ConvertKit reviews powered by real people opinions on Twitter. See what real people are saying about ConvertKit on Twitter to help you decide if you should buy email marketing software from ConvertKit. Real ConvertKit review (2019 update) from real people on Twitter to help you make the best informed decision if you should buy email marketing software from ConvertKit. ConvertKit is a relatively new product and although it doesn’t have all the bells and whistles that other more prominent email marketing software providers offer, it still gives small businesses and professional bloggers everything they need to manage email marketing campaigns. Additionally, features such as automation, tagging, and sending out a sequence of course emails add great usability to this platform. With ConvertKit, you can also set up as many forms, landing pages, automation rules, and autoresponders. Overall, ConvertKit is heading in the right direction and if this is what the early version has to offer, it will be exciting to see what new innovations future upgrades will provide early adopters with. ConvertKit’s cheapest email marketing plan is 29.00 per month. This company was launched in 2013 by Nathan Barry. So, it’s relatively new in the industry. Yet, ConvertKit offers impressive features that rival many other long-established email marketing brands like MailChimp and Aweber. ConvertKit’s mission is to help small business and bloggers to grow their audience and turn their email subscribers into paying customers. Their clients include a long list of successful niche blogs such as Zen Habits, Effortless Gent, Impossible HQ and The Ultimate Paleo Guide. Founded by Nathan Barry in 2013. The email marketing software scene is packed with autoresponders that each claim to help marketers manage their campaigns with ease. 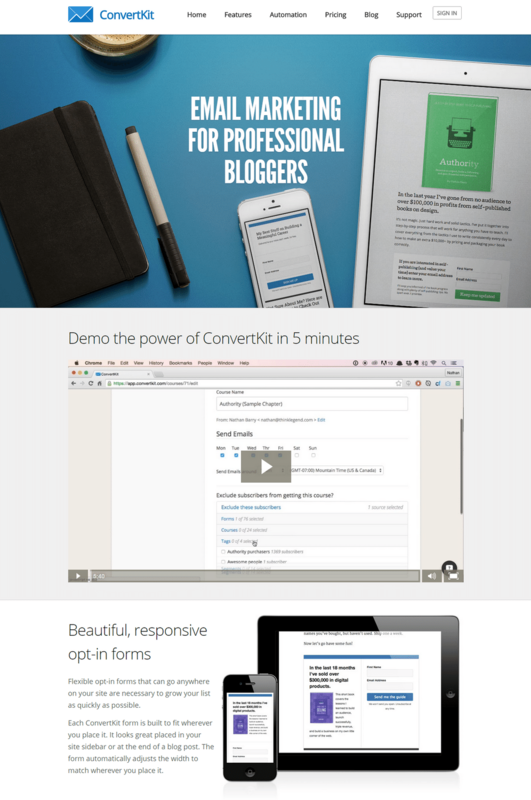 ConvertKit is no exception in that it pitches itself as the ideal email-marketing platform for professional bloggers. This company was launched in 2013 and is relatively new in the industry. Yet, ConvertKit offers impressive email marketing features that rival many other long-established email marketing brands like MailChimp and Aweber. Try ConvertKit. Send Unlimited Emails On Any Plan! ConvertKit offers list-based plans, meaning that prices depend on the size of your subscriber list. The starting plan is for businesses with up to 3,000 subscribers. Advanced plans are available for high volume senders upon request. Email marketers with less than 50,000 subscribers can send unlimited messages. This is a great feature for marketers who send plenty of emails frequently to a small list of subscribers. If you’re on a higher plan, however, an email limit is applicable. This limit is calculated by multiplying 15 and the plan’s subscriber limit. So, if your plan supports up to 60,000 subscribers, simply multiply that number by 15 and 90,000 will be your email limit. With ConvertKit, you can also set up as many forms, landing pages, automation rules, and autoresponders as you like. What are drip campaigns? They’re a sequence of emails “dripped out” one at a time in a sequence to subscribers at pre-set time intervals. These emails might consist of a series of related tutorials (forming an email course) or they might information on your various services along popular blog posts and customer testimonials. The process of creating these campaigns in other email marketing systems can be tedious and downright difficult. However, ConvertKit simplifies everything. For instance, you can create a series of emails to be sent over a period of one month after new subscribers join your list. At any time, you can drag and drop emails to re-order the sequence. You’ll also be able to see the entire drip email system in one view, which makes it easy to maintain good flow when creating your campaign messages. Once a message is sent, it’s marked as published and the rest remain in draft until the scheduled delivery date. But more importantly, you can do so much more than just the traditional drip campaign. The true power of marketing automation comes into play: You can create “If This, then That” rules. Why is this important? Because it enables you to deliver content that is more relevant and valuable to the individual vs. using a one-size-fits-all approach. For example, you can arrange for a recipient who doesn’t open one of the sequenced emails, to receive a special email to re-engage them. This is very different from the one-dimensional, “linear” path of traditional drip campaigns — where every person receives the exact same email until the sequence is over. This ConvertKit video provides a quick glimpse of the flowchart-like interface used for your email sequences. Contact ConvertKit to receive a demo. You can have an automation series set to trigger when people subscribe to your email newsletter. Those who check a box marking a particular interest (say, “vegan recipes”), would receive a different series of emails than those who check another interest box (say, “gluten-free recipes). ConvertKit has made it very easy to set up these automated email series. You can simply click and drag options onto a canvas and you’re done. No coding or advanced knowledge is required. Email courses have been used effectively as a freebie that attracts sign-ups, but plenty of bloggers sell their email courses as well. 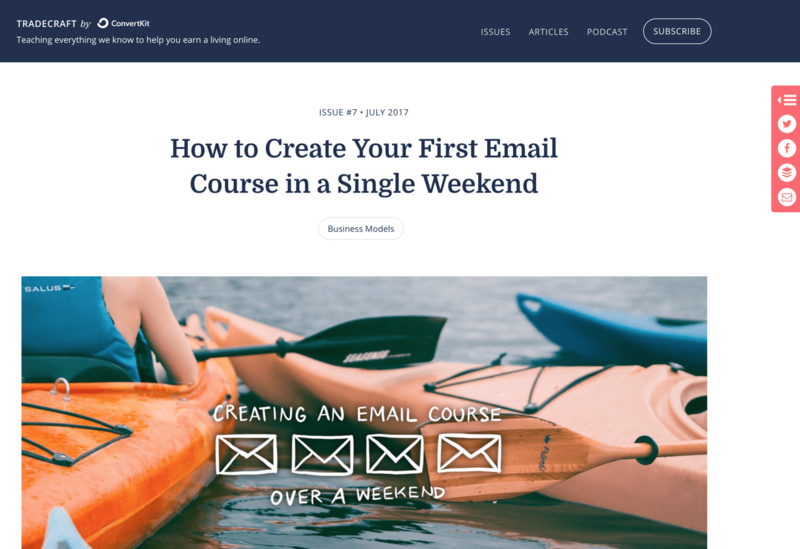 ConvertKit makes it easy to create email courses. You can even customize what happens at the end of the course. For example, you can offer a second course, and subscribers who show interest will automatically start receiving that second course. The ConvertKit blog has high-quality guidance on how to create effective email courses. Let’s take a closer look at automation. Email marketing software like ConvertKit helps you get the most out of your marketing efforts by using marketing automation. Marketing automation that lets you track, measure and automate marketing campaigns. Email marketing automation is a type of marketing automation. Depending on how you’ve set up your campaign, a specific email is sent to your customer depending on the action they’ve taken. Events, Actions, and Conditions are the building blocks behind ConvertKit sequences. If this sounds like it might be complicated to set up, software like ConvertKit helps streamline the process for you with its easy user interface. For most marketers using ConvertKit to manage their email campaigns, automation and tagging are the sellout features. Automation makes it easy to manage subscribers based on events while tags help to segment contacts. For example, you can tag subscribers automatically if they click certain links in an email. This, in turn, triggers a course of action such as enrollment in a Webinar, subscription to a course, and so forth. A big plus of ConvertKit: Move seamlessly between building your email automation sequence and working on the individual email content. If you’re looking into marketing your small business, you might have heard about sales funnels. A sales funnel is the path your customer takes to purchasing from your business. It usually starts with awareness of your brand, moves onto interest and decision. The end goal is a sale or conversion. An email marketing funnel will include sending your potential customer helpful content linked to your service or product. By setting up rules, you tell ConvertKit which emails to send (and when). To keep it simple, ConvertKit visualizes the process so you can immediately see your funnel and all you have to do is add the content. This approach means even if you’ve never built a funnel before you’ll be able to craft a compelling email campaign. ConvertKit also has a free email course to get you started. The landing page creator is a great addition that ConvertKit offers to help website owners who have little to no design skills. Using the visual editor, there’s no need to write code for your landing page. You can change colors, upload images, and alter text with just a few clicks. Although there are only three landing page layouts to choose from, ConvertKit offers full access to CSS for those with somec coding ability who wish to create a unique landing page design. ConvertKit landing pages are also integrated with a large collection of textures and patterns from SubtlePatterns.com. Therefore, you can be sure of finding a landing page style that matches your brand or website theme. Where are My Landing Pages Hosted? When it comes to hosting landing pages, ConvertKit is quite flexible. You have the freedom of hosting landing pages on ConvertKit servers or move it to your own domain using a WordPress plug-in. Adding a lead magnet to your landing page is a great way to get customers to sign up for your subscriber list. A lead magnet is a resource you use to attract potential customers: leads. In exchange for your free resource, your customer shares their email address. ConvertKit comes with support to add lead magnets to their forms. How Can ConvertKit Help Small Businesses? Here are a few ways you could use ConvertKit to achieve your business objectives. Engage at the outset Automated welcome series based on users’ interests. Automatically identify and retarget those who don’t open emails. Deepen the connection Use lead magnets to send recipients a content series that is relevant and valuable. Monetize Develop funnels and monetized content like email courses. An email marketing campaign would not be complete without signup forms. ConvertKit comes with a form builder as expected from any typical email marketing application. Using this tool, you can create multiple attractive opt-in forms and place them anywhere on your website. Though basic in function, the form builder does its job well. ConvertKit also comes with responsive signup forms too. This means that the forms automatically adjust to the screen of the device used to access your website, be it a PC or mobile phone. Email marketing has a bad reputation. Some people think it’s spam, and wonder how much they’ll get from email marketing. The truth is a targeted email campaign — where you’re communicating with customers who want to hear from you can help grow your business. And the fact that your subscribers have selected to receive your correspondence makes all the difference. All email marketing services will require a customer to opt-in, and many offer double opt-in options. ConvertKit’s double opt-in delivers an email to subscribers to confirm they’d like to be on your list. ConvertKit reports higher engagement from double opt-in subscribers who have confirmed their interest in your brand. Managing contacts with ConvertKit is fairly simple. Of course, there would be no list of contacts to manage without prompting visitors to subscribe to your blog or website. With that in mind, you’ll be glad to know ConvertKit offers permission-based opt-in in forms to gather contact information from interested subscribers. It can create multiple forms, each one offering a different incentive to entice various subscribers into joining your mailing list. For those migrating from another email marketing provider, simply upload your contact list via CSV into ConvertKit. Once you’re done uploading the file, you’ll receive a message confirming that your contacts have been successfully imported. The subscriber page marks contacts as confirmed, unconfirmed, canceled, or complained to describe their status on the list. Subscribers can be tagged and segmented if you want to send targeted messages to a specific group — for example, you could create an email series to target individuals who attended a particular webinar you held, or an in-person conference you exhibited at. As mentioned earlier, ConvertKit offers email creation features that allow you to send a course of messages automatically. You can create multiple email messages, save them as drafts and schedule when to send. Email course scheduling can be great when sending content that is relevant to specific subscribers. However, sometimes you’ll need to send one email blast to everyone on your list. To accomplish that, ConvertKit offers a broadcast function. A broadcast email is when a single email is sent to multiple people at the same time. This feature is great for announcing special offers, product launches, or time-sensitive discounts or news. Currently, customers have no access to live chat and phone support. However, you can always get in touch with a customer support agent via email. While this might not sound too assuring, one unique aspect about contacting ConvertKit is that when you submit a question or complaint, they personally look into your account. If something is lacking, the assigned support agent will make recommendations to help you improve your results or enjoy a better experience. In addition to email support, ConvertKit hosts workshops, offers training materials, and provide plenty of online help documentation. The knowledge-base categorizes help articles according to topics, thus making navigation easy. Alternatively, you can use key phrases to search for help articles. ConvertKit offers analytics tools for easy campaign tracking. You can track email opens, bounces, visitors, subscribers, and conversion rates for each campaign separately. The program also tracks website statistics for different forms to help you know which signup tactics are providing the best results. For instance, you can examine conversion rates as well as the number of subscribers that joined your email list via the pop-up modal or the ones who signed up for incentives using the sidebar form. ConvertKit creates email courses easily. The landing page and form creators feature intuitive interfaces. Email scheduling and automation features save time. Subscriber tagging facilitates list segmentation. Migrating to ConvertKit is simple since you can import contacts via a CSV file. Built-in reporting tools track campaign metrics easily. ConvertKit offers the ability to create multiple sign up forms for different pages and track their conversion rates individually. Currently, no free trial is available but new subscribers are protected by a 30-day refund policy. No phone or live chat support is provided. Limited third-party integrations compared to other email marketing platforms. ConvertKit is a relatively new product and although it doesn’t have all the bells and whistles that other more prominent email service providers offer, it still gives professional bloggers and business owners everything they need to manage an email campaign. Additionally, features such as automation, tagging, and sending out a sequence of course emails add great usability to this platform. The following are a few commonly asked questions about ConvertKit. Have a question that’s not addressed in this review? Send it to us: we’ll research it and post the answer here. I’m a small business owner who’s new to email marketing. Will I be able to easily understand the ConvertKit how-tos? How do I use the ConvertKit WordPress plugin? Activate the plugin through the “Plugins” menu in the dashboard. Go to the Settings page by clicking on the link under the ConvertKit plugin. Enter your ConvertKit API key. Click save. Select your default form. Click save. The ConvertKit WordPress plugin makes it easy to embed a lead capture form into any WordPress post or page. Does ConvertKit offer integrations? How many are available and what types? ConvertKit offers approximately 90 pre-configured integrations. You’ll find them listed on the ConvertKit “Integrations” page. Note that hundreds of additional integrations are available via Zapier. ConvertKit offers list-based plans, meaning that prices depend on the size of your subscriber list. The starting plan is for businesses with up to 3,000 subscribers. For more information and latest and most up to date prices visit ConvertKit website. We monitor tweets about ConvertKit and apply sentiment analysis to classify tweets as positive or negative. This allows us to output an approval rating score, which is based on real people, positive and negative, opinions about ConvertKit on Twitter. ConvertKit approval rating score is 90%. This is based on a total of 10 tweets that mention ConvertKit on Twitter. There are 9 mentions that share a positive sentiment and 1 mentions that express a negative sentiment. Find out more about how it works. #EmailMarketing is the way to go! It's so necessary to grow your business. Check out @ConvertKit - I'm loving it. @HelloShunta I love your enthusiasm about trying new things and improving yourself! Way to go! And yes @ConvertKit is EVERYTHING! @ConvertKit @periscopeco I love this concept! So there's no limit to how many emails you can have in a sequence? @HelloShunta @PatFlynn AWESOME! It's a great system- & you're gonna love it- let me know if you have questions & @ConvertKit team helps too! @ConvertKit Thank you for the quick response! I'll check out the article now! Try ConvertKit. Send unlimited emails each month on any plan. No limits! Next: GetResponse Email Marketing: Can It Really Beat MailChimp? We Reviewed It To Find Out.